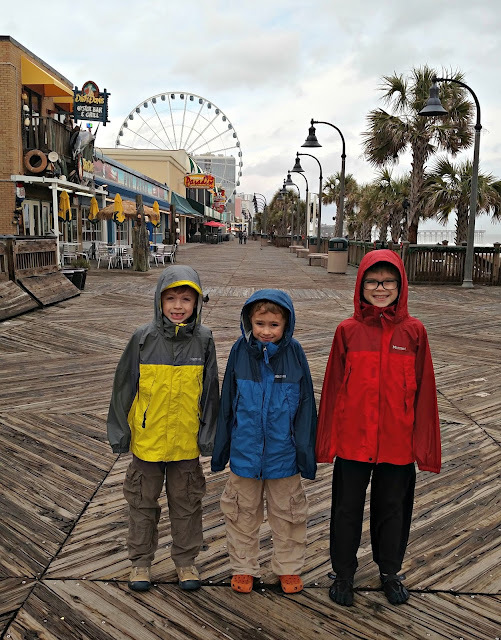 I have a few more cell phone pics I wanted to share from our short trip to Myrtle beach. Here are the boys on the boardwalk. It rained all morning but finally lifted in the afternoon. We were glad we brought raincoats. I love how quiet it is in the winter. Mostly just older couples walking on the beach. I guess a lot of kids had to go back to school before we did. 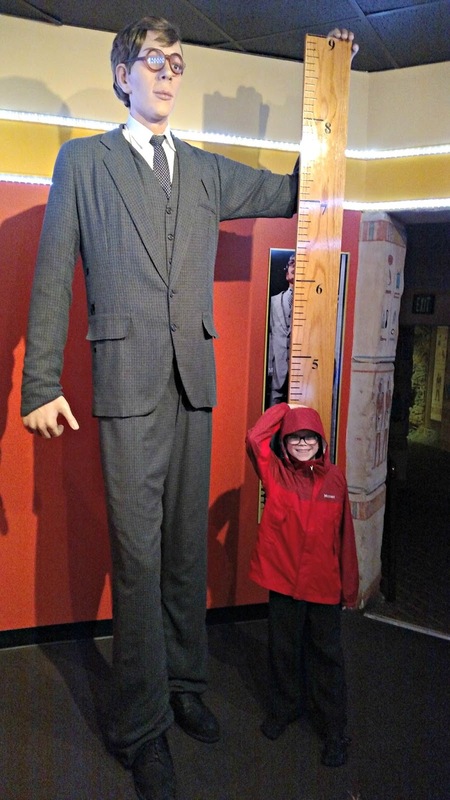 The boys wanted to go to Ripley's Believe It or Not Odditorium. They love the Ripley's books and are frequently checking them out of the library. I have to admit the Odditorium was really fun. 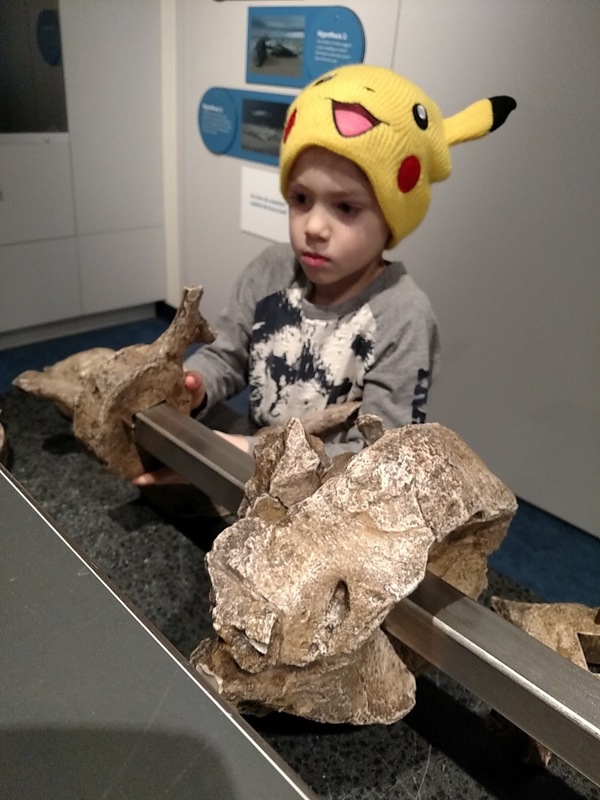 Lots of quirks and history and some hands on, too. Here, Pierce compares himself to a wax figure of the largest man. 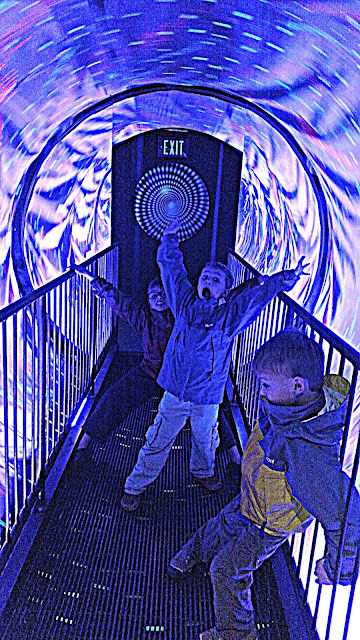 The boys loved this dizzy tunnel. The lights are spinning a circle around you, and although the floor does not move, when you get in there it's very disorienting. If you stand there for a minute it starts to feel like you are spinning yourself. There were other fun things like a scary mask with a jewel inside, that when you reached for it, sent out a big puff of air (I may possibly have jumped in the air and yelped over this. Luckily, we were the only people in there at the time). There were also some great computerized dance and fight simulations that we all loved. 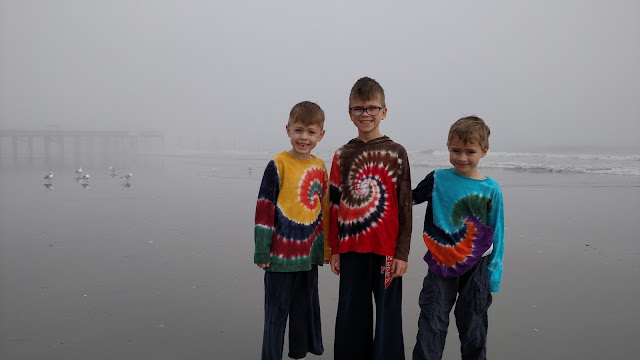 Since the boys had such a long winter break, we decided to take a brief road trip. Hotels are so cheap at the beach this time of year, and I love the beach in winter. I like that it's quiet and you can admire the scenery in peace. It was so misty the day we got there that we couldn't see very far. It was nice though - about 68*. My aunt and uncle gave the boys gift cards for Christmas, and we used one to go to Ripley's Aquarium. It was really fantastic. 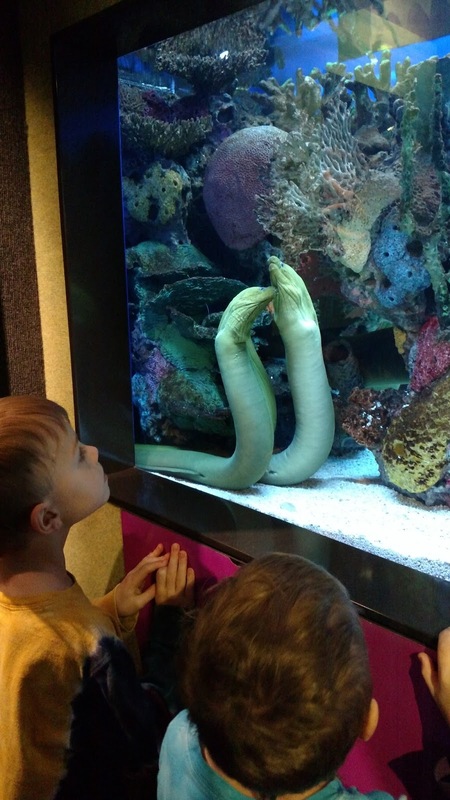 Something is so relaxing about watching sea creatures. Pierce found one that he bonded with below. The highlight was the shark tunnel, which was long and wrapped through the tunnels on a moving sidewalk, so my pictures were blurred. Sharks were swimming on both sides and overhead - and there were so many different types of sharks. 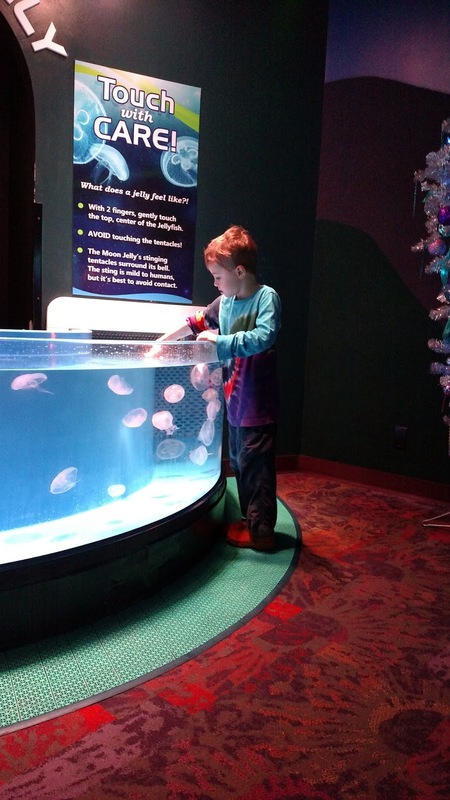 But another highlight was petting moon jellyfish, which I caught below. 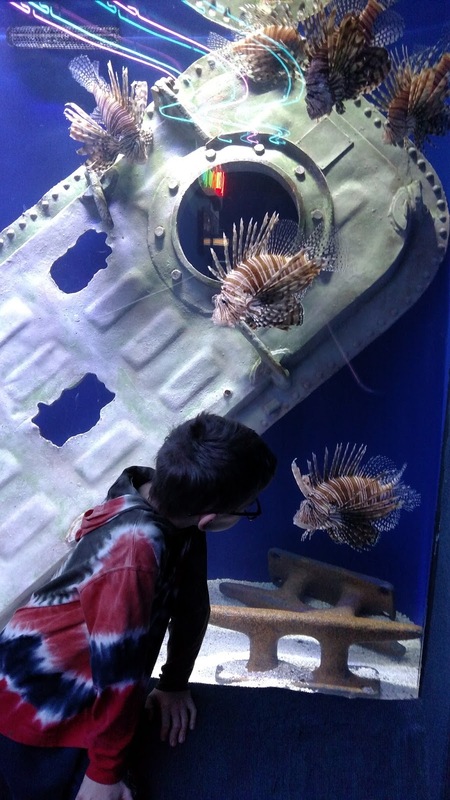 We also pet some horseshoe crabs and some small sharks. The aquarium is pricy, but I think it was worth it for all they have to see. The boys and I all were amazed by the different sights there. We had a fun break over Christmas. I didn't have to teach any classes and the boys were out of school for several weeks. Here are a few things we did. Cort asked for a cotton candy machine for Christmas, which my parents got him. 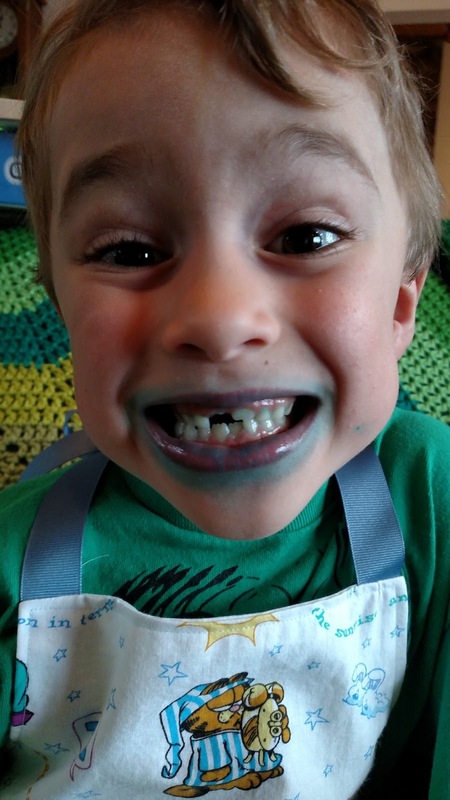 The blue raspberry turned his lips and tongue blue. We went to the Martinsville science museum one day. Pierce's preschool teacher, who has kept in touch with us over the years, came along. We had an excellent time. Below is Reid threading whale bones. The highlight of the trip was when Mrs. Mack and I were chatting in the gift shop and heard Pierce behind us saying, "I'm feeling romantic!". We both stopped and looked at each other in surprise, and then turned around to look at Pierce (who is a very concrete thinker and definitely doesn't go around talking about his emotions). Turns out he had a mood ring on and was reading the color chart to see what his mood was. Mrs. Mack and I laughed and laughed over that. One day we went roller skating. 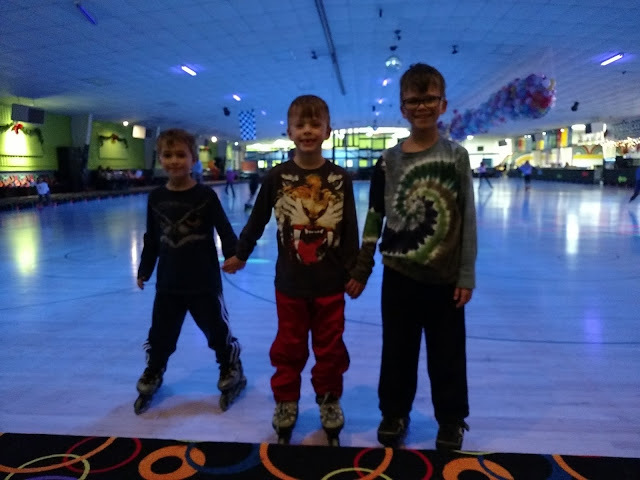 The boys had so much fun that we have decided to go roller skating a lot more often. It really clicked for Reid and Cort this time, and they found themselves skating more confidently by the end. I have another winter break post coming up soon. Readers, did you do anything fun over the holidays? The past year wasn't my best running year, but it wasn't my worst either. I developed Morton's neuroma on my right foot last January, and battled it all year. I had a couple of cortisone shots, which helped, but didn't cure. I've been using metatarsal pads in my shoes and had active release therapy (ART) done on it a few times. Surgery isn't an option in my opinion, as it is not always successful and can cause problems worse than the neuroma. Some days are better than others. But it did affect my mileage this year. In all, I ran 1419 miles. I ran three races, and those were fun. I especially enjoyed the 24 hour race I did in November, even though I didn't run the full 24 hours. 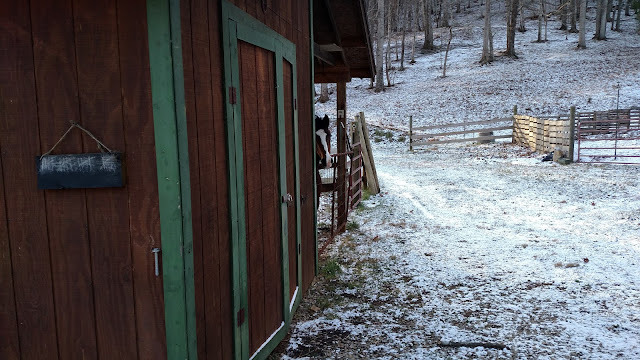 Here's a picture from our first snow dusting this winter. You can see the little chalkboard on the left where I keep track of my miles when I'm doing long runs at home. You can also see Francie checking me out. She's doing well. And to the right is my garden area. Hoping my foot will improve over the next few months. Taking time off doesn't seem to help much, so I'm just trying to learn to manage it run by run. 1. Running Girl by Simon Mason. I won an advanced reader of this Young Adult mystery on Goodreads. It was engaging and amusing. Enough so that I'm hoping the author writes a sequel. Please note that if you are buying this for a young adult in your life, it does have drug use. 2. Heart in the Right Place by Carolyn Jourdan. This is a hilarious and authentic memoir of a woman who works in a high paced office for a senator in DC. She ends up moving home to help out her dad's small town medical practice when her mother has a heart attack. 3. The Sea House by Elisabeth Gifford. Historical fiction exploring the legend of mermaids (and incorporating a real medical condition as explanation). Intriguing writing that made it hard to put down, even in the slower parts. 4. The Perfect Son by Barbara Claypole White. A story about a distant dad who has to take over the needs of his highly functioning but autistic son when his wife is hospitalized long term for a heart condition. Bittersweet and at times quite funny, this was an excellent read. 5. The Gravity of Birds by Tracy Guzeman. I'm not certain who gave me this book. It had been sitting on my shelf for a couple of years. I picked it up and was immediately drawn in to family secrets and dynamics, and a lost painting. I recommended it to several people, who all loved it too. 6. Small Great Things by Jodi Picoult. I have read every book Picoult has written. I love her ability to take ethical dilemmas and make you see every side of them. But this book? She outdid herself with this book! Some have been calling it "To Kill a Mockingbird for the 21st Century" and I'd have to say that's an excellent phrase to sum it up. 7. The Magician King by Lev Grossman. 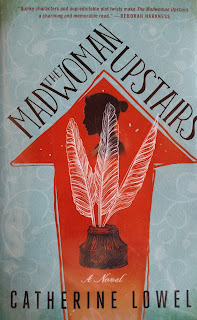 This is the second book in a trilogy and I read them all, after finding the first on a list of books for adult fans of Harry Potter. This book was my favorite of the three, but you should read the first one first. 8. 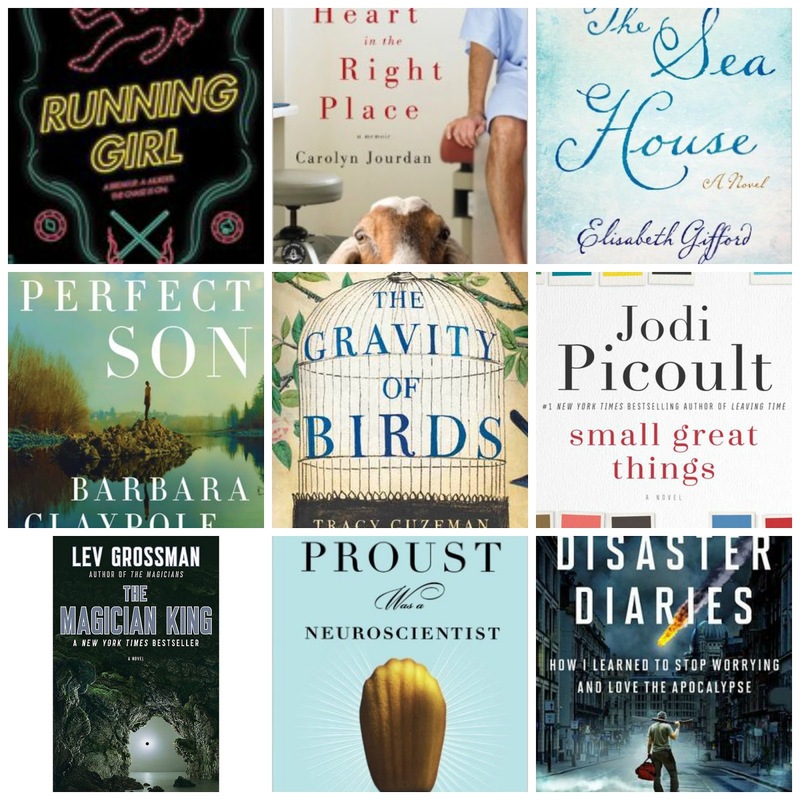 Proust was a Neuroscientist by Jonah Lehrer. This is another book that had been on my shelves for years. If I'd known how good it was, I would have read it sooner. Each chapter has a different angle on neuroscience combined with insights from classic literature and art. I know, it seems an unlikely combination, but it is so well done and fascinating. 9. The Disaster Diaries by Sam Sheridan - the author has been worrying about the apocalypse for years, and finally decides to do something about it. So he takes each aspect of survival preparation and seeks out an expert in that field for training (how to live off the land, how to defend oneself, etc.). A unique perspective with a lot of useful information. 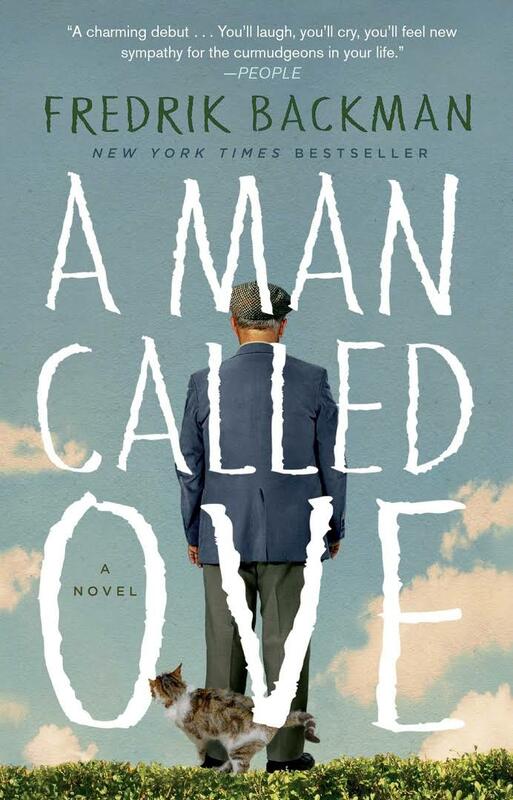 A Man Called Ove was recommended by a friend, and I think it was my favorite book I read all year. And my mom recommended The Mad Woman Upstairs, which was also excellent reading. Well, that does it! Readers, do you have a favorite book you read last year?